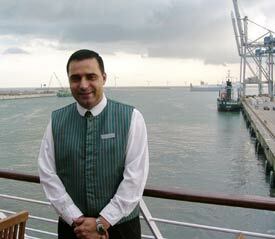 ABOVE: Artur, a waiter in the Terrace Café, kept watch over us each morning as we had breakfast on deck. Food has been a popular topic of discussion among cruisers since the days when emigrants to the New World were expected to bring food on board and cook their own meals. On the Silver Whisper, the debate is likely to be centered on the relative merits of smoked Norwegian salmon and the whisky-cured Scottish equivalent, or whether to order foie gras or caviar before the grilled sea bass or the herb-encrusted rack of lamb. The Restaurant, an elegantly appointed dining room that offers breakfast, lunch, and dinner. A typical dinner menu will offer a selection of hot and cold appetizers, a salad, two soups, a sorbet, and several entrées, including a pasta, risotto, or other vegetarian dish. A "Cruiselite" menu offers low-cholesterol, low-sodium, and low-fat choices for health-conscious passengers, and alternative selections such as steak, chicken,salmon, and pasta are available for guests who want a break from more elaborate cuisine. Desserts nomally include assorted pastries of the day, ice cream, and at least one low-calorie or "zero-zero" item for dieters and diabetics. The Terrace Café. At breakfast and lunch, this is an elaborate buffet with a cornucopia of hot and cold items. Waiters carry your plate to the table and keep you supplied with beverages. Cooked-to-order items can also be requested (e.g., pancakes or omelettes at breakfast and the pasta of the day at lunch). During the evening, the Terrace Café becomes a reservations-only alternative dining room for 20 to 50 guests, with theme dinners such as "Paris-Nice," "La Cucina Italiana," and "Secrets of the Sea." Pool Grillé. In decent weather, you can order hamburgers, hot dogs, panini, and salads from noon to 4 p.m. Waiters serve you at teak tables near the pool, and drinks are available from the Pool Bar. Panorama Lounge. Boullion and crackers are served here between 11 a.m. and noon; from 4 to 5 p.m., you can stoke up on finger sandwiches, pastries, and cookies at Afternoon Tea. The Silver Whisper's food is outstanding, and executive chef Laurent Austrui keeps things interesting by offering local dishes where practical: e.g., fresh fish from the Copenhagen market and haggis during Scottish itineraries. Gabriele Chappini, the head sommelier, livens up the complimentary and connoisseur's winelists by buying directly from local vineyards as the Silver Whisper cruises the world.